Gallery Stroll artist reception Aug. 21, 6-9 p.m. In a world where people form opinions based on surface impressions, clothes are the surfaces with which we cover our bodies— to protect and hide, but also to reveal something about ourselves. Besides the utilitarian function of clothing as a cultural artifact, it is also infused with mystery, symbolism and status. The exhibit Articles of Clothing opens July 31 at the Rio Gallery, with the aim of examining the phenomenon of apparel to uncover levels of meaning sewn into its fabric. Fairview artist and Brigham Young University art professor Joseph Ostraff is curating the exhibit, and he proposed the subject to the Utah Division of Arts & Museums, which operates the gallery. "The idea of clothing [as subject matter] is such a broad topic, and there are so many possible applications and interpretations," Ostraff says. Among the artists eventually selected for exhibit were Von Allen, Daniel Barney, Jennifer Barton, Gary Barton, Fidalis Buehler, Brian Christensen, Jen Harmon Allen and Sunny Taylor, as well as Ostraff himself. "Utah Arts & Museums has a reputation for exhibits with strong social emphases, and the Rio is a true central public gallery, rather than a commercial space," Ostraff explains. "It's a place where a dialogue about the subject can take place." With the rich historical veneer of the building and the gallery as a site to view art, it lends the show a layer of historical context in which clothing as social signifier occurs. It's implicit in the show, but the site emphasizes that quality. The artists in the exhibits are all current or former BYU faculty, except Jen Harmon Allen, who is a former graduate student. But it's not strictly a "BYU art show"—the artists are notable in the larger art community: Ostraff has been the recipient of a Utah Arts Council Visual Arts fellowship and mounted an installation at Arizona State University at Tempe earlier this year. The variety of media used to address the subject is surprising—from cloth to ceramic, paint, steel and mixed-media. Former BYU professor Sunny Taylor incorporates geometric and architectural forms in her paintings, and here they demonstrate the ways items of clothing interrelate with other objects in the world, even as they bridge the gap between the human subject and the inanimate object, as the costume in which identity takes the stage. Von Allen and Jen Harmon Allen both contribute 3-D mixed-media pieces. 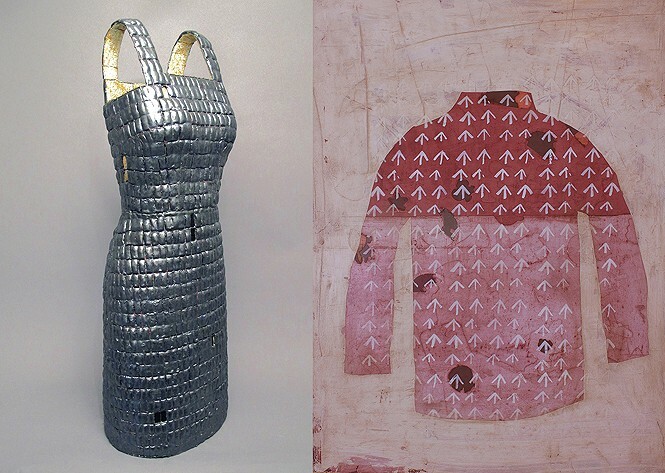 Harmon Allen created beautiful wire-frame dresses inlaid with ceramics, in works such as "Dress of Armor" (pictured left). Burton's paintings deal with the status or value placed on clothing. Ostraff's own paintings, like "Sunday Best #2," are based on his experience traveling in Ireland. He saw the print designs for 19th-century prison uniforms there. He brought some patterns home and combined them with dress shirts he wears to church. "They play with what's really inside a person," he explains. "You can wear a white shirt, but still have flaws." The word "Articles" in the exhibit's title suggests the role of clothing as cultural language or signifier. Ostraff admits, "Sure, it could be connected to that. I chose the title because it's a neutral describer of clothing: open as far as gender or usage. It was all left to the artists to interpret the diversity of the subject, and the components that make up all the elements of things that clothing embodies." Several of the artists deal directly with gender. Harmon Allen's works feature a series of dresses worn at fancy, out-on-the-town events, and they take a look at gender as well as status, the way items of clothing manifest gender stereotypes. There have been a number of local events in recent years that have combined art and fashion, often to the detriment of the art, but this one manages to skirt that problem with its idiosyncratic juxtaposition of media, styles and statements about the subject matter. "Articles" also might refer to the LDS "Articles of Faith" for these faculty and student artists of the Mormon-owned university; there's nothing ecclesiastical in the work, but there is faith in the power of apparel as conveyer of meaning. The exhibit might be taken as a miniature lexicon of the language of clothing. What this exhibit articulates, more than anything else, is the way these artifacts connect us. Ostraff notes, "There's so much implied in clothing, and ... in how we see each other, that when we bring it up for discussion in an exhibit like this, it expands our understanding of each other."